To achieve a 15 per cent reduction in the average turnaround time from 28.4 hours to 24 hours for all standard instrumentation from decontamination stage to dispatch stage by August, 2018. Improved patient experience - reduced surgery delays, cancellations and rescheduling. 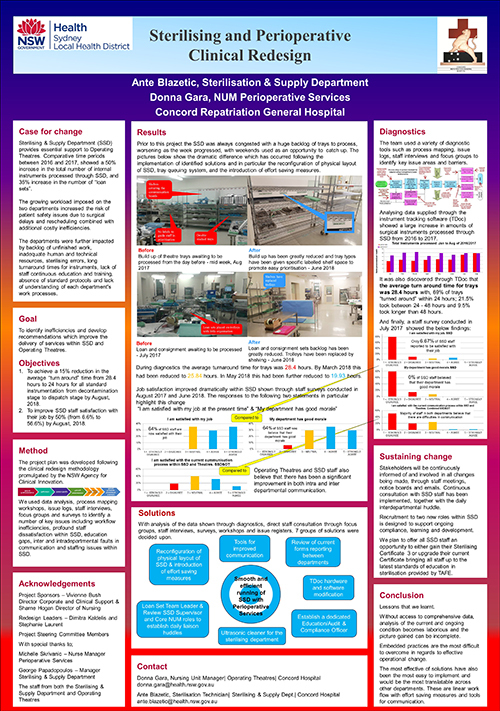 Improved communication between the sterilising department and operating theatre staff. Standardised processes for staff to follow. Improved education opportunities for sterilising department and operating theatre staff. Significant cost savings to the NSW Health system. Performance and financial targets are consistently met. From February 2017 through to December 2017 the number of operating theatres at Concord Hospital increased from 10 to 11. This additional capacity led to a nearly 13% increase in emergency surgery procedures and an overall increase of around 6% for the total number of surgical procedures during this period. surgical delays, rescheduling and costly inefficiencies. Senior management were often required to step in and attempt to resolve issues. This project was an opportunity to review and revitalise inter-departmental relationships, organisational culture and work practices. Following the diagnostics phase, the project team came up with a series of recommendations. Purchase an ultrasonic cleaner machine for efficient sterilising services. Create a new position, Educator/Audit Compliance Officer, to facilitate education and training of staff in the sterilising department. Reconfigure the physical layout of the sterilising department to allow streamlined workflow and minimise opportunities for errors. Expand the electronic system, total documentation system, to enable real-time tracking of instruments. Create a Loan Set Team Leader position by re-grading the existing position. Establish a working party to review and redesign current communication forms (i.e. fast tracking, error reports, etc.) used within operating theatres and the sterilising department. Implement a daily huddle with the morning supervisor of the sterilising department and the nursing unit manager for the operating theatres to improve communication between the two departments. Re-establish a quarterly meeting between the two departments. Implementation - the project is currently being implemented, piloted or tested. This project commenced 17 July 2017 and is ongoing. At the time of the initial review in 2017, 90% of sterilising department staff surveyed reported low job satisfaction. The survey was repeated in June 2018 and found the number had dropped to 35% of staff. Previously, it was difficult to source meaningful data from the electronic system used in the sterilising department as the captured information included data from another facility and the existing database was out of date. A new version of the electronic system was purchased to ensure that data is accurate and current. Inefficient and recursive work flow processes were identified. To address this issue, the physical layout of the sterilising department was reconfigured and will be under continual review, in consultation with staff. Communication between the sterilising department and the operating theatres has improved following the establishment of a daily huddle and reinstating quarterly meetings between the two departments. Appropriate labelling of shelf space for instruments and trays means that sterilising department staff are aware of the total number of trays in circulation and able to prioritise their workload accordingly. Installation of a loan set whiteboard provides an efficient way to track third party loan instrumentation sets and has helped to improve communication between the sterilising department and operating theatres. Sterilising department staff are actively engaged in monthly staff meetings and provide documented minutes for circulation. This has led to an increased sense of inclusiveness and improved morale within the department. Education in-service was conducted to inform the staff of the updated and redesigned communication forms. This will be reviewed again in September 2018 to ensure it is being used correctly. Managing an organisational project can be complex as staff may be fearful of change and the potential for negative impact on their current work practice. Effective stakeholder management skills are necessary to ensure buy-in across the business. Proficiency in Microsoft office applications like Word, Excel and Visio can be useful when managing multi-faceted projects. Effective time management is critical for regular reporting.